Armor Shield is a 29 oz. architectural vinyl building cover that was designed to provide maximum strength and durability. ClearSpan covers are built for strength. Just look at this 12.5 oz. cover material and structural steel frame lifting a Dodge quad. With in-house manufacturing and installation services, ClearSpan can get you the building you need quickly. All buildings are factory direct to your door, ensuring an efficient and streamlined process. ClearSpan's environmentally friendly buildings feature recycled materials and limit energy consumption through natural lighting and climate-sensitive covers. ClearSpan manufactures and builds with only the finest, highest-quality materials, ensuring that every building is durable and long lasting. 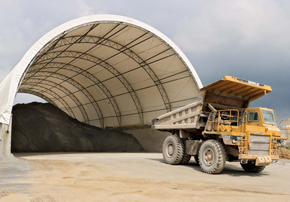 With stock, turnkey and custom buildings, ClearSpan can meet any building need in any industry. ClearSpan buildings are constructed in our own Hercules Truss Arch Building in Dyersville, Iowa, using American materials. ClearSpan buildings come with industry-leading warranties that include 50 years on frames, 25 years on corrugated metal and 20 years on fabric covers. 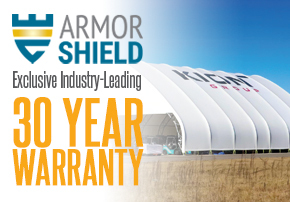 ClearSpan recently released our exclusive Armor Shield Cover, which features an industry-leading 30 year warranty. Learn more about this ultra-durable addition to our extensive product line.